Animator and comic artist LeSean Thomas discusses his Cannon Busters Kickstarter, culture shock, and what "anime" really means. LeSean Thomas is not one to ever worry about idle hands. 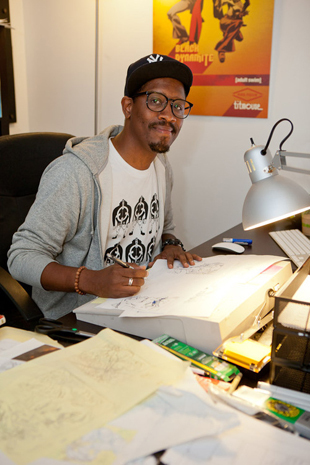 After all, for more than ten years, the comic artist/animator has kept those hands busy contributing his artistic talent to a slew of shows, including Nickelodeon's The Legend of Korra, the Peabody Award-winning animated series The Boondocks and Adult Swim's raucous, over-the-top Black Dynamite: The Animated Series. What little free time Thomas has, is now being spent developing his own animated series, Cannon Busters, based off his creator owned comic book. Cannon Busters tells the story of S.A.M, a "high-end, royal-class friendship droid", who finds herself exiled from her homeland after a mysterious sorcerer seizes control. Joined by a discarded maintenance robot and young but deadly outlaw, S.A.M. sets out to find her missing friend, the last heir to the throne, in hopes of saving the kingdom from the clutches of the dark sorcerer, Locke. With a Kickstarter effort in place, Thomas hopes to raise $120,000 to put together an initial pilot for the series. He's not doing it alone, though, as Thomas has teamed up with some big names in both comics and animation to bring Cannon Busters to life. We had a chance to sit down with Thomas to discuss Cannon Busters' development, how working globally has affected his work as an artist, and what really defines the term "anime". For those who may not have heard of Cannon Busters before now, give us a little background on the story and how it came to be. Cannon Busters is a comic book idea I developed while home in NYC over fourteen years ago. It was one of the many ideas I had for comics at a time when I'd just wrapped up work in animation as an assistant animator on Disney's Lizzie McGuire show. The book itself had only two issues before I stopped work on it, because I couldn't develop the book and be a Supervising Character Designer and Co-Director on The Boondocks on Adult Swim. I underestimated how much work was involved trying to do both a comic and help make a wildly successful animated TV series, so I decided to put the book on hold, with the plan to continue work on it at my leisure and eventually release it as one graphic novel. That didn't go so well, either. Fast forward to me having an opportunity to relocate to Seoul South Korea to work as an employee at sub-contracting animation house, JM Animation in Seoul, which allowed me to meet animators and directors to collaborate with. This was when I saw an opportunity to adapt it in animated form. Did you always plan to develop a Cannon Busters animated series, or did it come about as a result of your own shift from comics to animation? Yes and no. Actually, it was something that I always hoped would happen, but at the time of its inception, I had more access to making comic books than producing animation. And since my experience and credentials weren't quite where they needed to be to make it an animated project first, making it a comic book was the logical choice at the time. At the same time, building my experience and relationships over the last ten years while still developing it allowed it to make the transition to animation more naturally, seeing as my primary focus was 2D animation production.